“Sir, is that a 3D printer?” I enquired, “Yes Al, let’s unpack it and see if we can get it working. Are you free after school?” That was the start of it. We took the Robox out of its packaging followed the quick start-up guide and 3D printed our first ever product in under an hour. The product itself was a very small pyramid from the sample files but it was a very definite, very successful start. I’m liking this already! Like most D&T departments in state schools, the acquiring and implementation of new technologies and equipment is something that has to be carefully managed and justified in budgets. One of the first markers for whether a piece of equipment is worthwhile is the question of impact. On Open Evening Al chose to run the Robox for 4 hours producing a much larger and more complex model. The interest from prospective students, current students, parents and staff was incredible. The feedback sheets from the evening consistently noted two amazing things seen at Open Evening; the brand new sports hall and the 3D printer in D&T. “Stage two Sir?”, “Yes Al, stage two”. Can I use it in class as a useful piece of equipment in the Product Design students’ tool box? The department already has a small laser cutter and a vinyl cutter that are used relentlessly. In order to test this out Mr Nicholson ‘gave me the keys’ to take it for a proper spin, designing and making. I’m on the AS D&T Graphic Products course and I’m at the design stage of a project to design and model an ‘outdoor’ classroom to be set in the school grounds. I downloaded a free copy of Autodesk-123D and set about the scale model. The bed of the Robox is about A5 and my card model was considerably bigger. The 3D print would be too small if I made it fit the bed so I chose to use the 100mm Z axis and the A5 bed as a start point. I split the model into 8 pieces, 6 of which were doubles (keeping the design modular really helps when you’re using CAM!). I ran the Robox all day and overnight, carefully removing the pieces from the machine’s bed. I used a 10% infill for the blocks so that they would be rigid but not use up too much of the PLA filament. I could stick them together to form the completed model but it’s more useful at the moment for me to have them in smaller blocks so that they fit in my school bag! I’m not used to D&T being quite this straightforward! 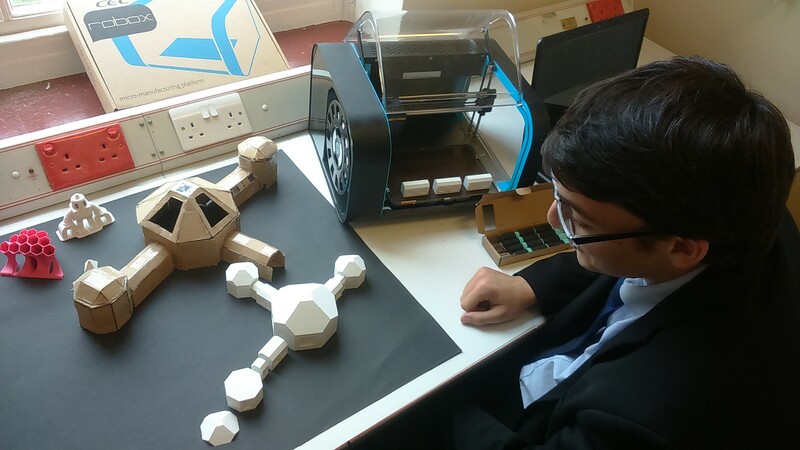 At the point where a number of schools were considering the future of their D&T departments, for financial reasons, Ashlyns were determined to keep the breadth of curriculum and the enrichment that D&T offers. The subject was allied into a Faculty structure with Computer Science and Business Studies. The cross-linking between these three quite different subjects is growing by the day and at its heart is creativity and enterprise, ably assisted of course by control technology, software and CAM. The Faculty’s results have gone from strength to strength as the interest builds and the ‘newer’ technologies are introduced and take their place alongside the traditional. I use the word ‘alongside’ for various reasons. Can I afford a whole class of 3D printers? Would I want to? The answer to both is no. Firstly, I could have bought 10 Robox machines for the price I paid for the laser cutter but then students make so much use of the laser cutter, so quickly and with such a variety of materials. Secondly, every new piece of technology adds another dimension to the subject and doesn’t need to replace anything, older methods often employ a more appropriate level of technology. Most D&T A’ Level courses still have a 50% restriction on how much of the final work can be manufactured using CAD/CAM. Possibly to make sure that traditional skills are still developed or to enable a more level playing field for students from different socio-economic backgrounds, the restrictions are there and may well still be there after the introduction of the new specifications. Has that stopped us from using other forms of CAD/CAM in the past? Of course not, life without the laser cutter doesn’t bear thinking about and as the necessity to increase the students’ exposure to newer technologies for example through the NC 2014 it will need to become part and parcel of what we do. With the NC 2014 in mind, the opportunities to develop some designs based on biomimicry is next on my list! Before getting the Robox I used to trot out a number of reasons why the department wouldn’t need a 3D printer, mainly based around speed, size restriction, cost but the truth is that you just need to be a bit creative with how it gets used and as always the D&T community is full of ideas and ways forward. The following are a few that have sprung to mind. Firstly, everyone designs and then the class vote for which one gets made (and sometimes those still interested can come back at lunchtime or after school to get theirs made!). Secondly, smaller multiple designs that can fit on the same machine bed. Thirdly, increase the number of machines. I already have systems in place to help replace cookers and sewing machines so I just need to add them to the list and buy half-a-machine per year (or ask the school association!). Lastly, the Robox is a very portable machine and has already been at home with me. The rapid set-up and zero clamping means that the files just need to be left to get on with manufacturing! It has to be said that the efficiency of the material consumed is financially useful and the outcomes even on draft resolution are easily enough to portray the detail required. With new materials coming online, that go beyond the already available plethora of colours, such as rubber and dissolvable media, the future is brightly coloured and very flexible!